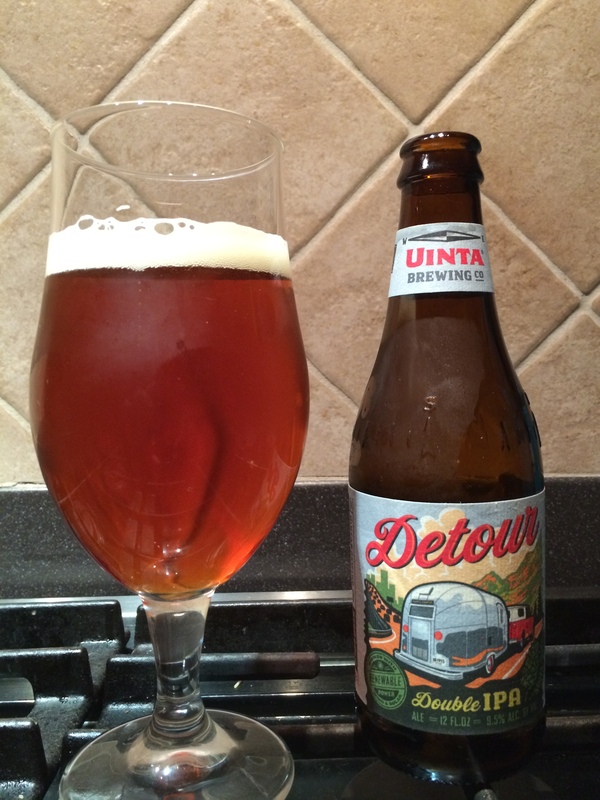 Brew Facts: In 2011, Detour won a Bronze medal from the North American Brewers Association Awards. That’s about it for interesting background. Oh, and the hops used to brew this grow from the leavings of a Kodiak bear that has recently beaten and consumed a Sasquatch in glorious paw to hand combat. Rare indeed. Appearance: Gold and amber with a finger thick, foamy white head. It held strong for a few minutes until giving way to the humid night. No haze or even bubbles weave through the glass. It is a nice looking IPA that stays calm and still, which might hold the aroma back a bit. Aroma: The initial smell is weak. After spending some time with it, I get hints of mango, lemon, pine and some sweet malt. A nice citrusy fruity pebbles aroma is right in my wheelhouse. It doesn’t overdo the malt and hit the bread pudding level of sweet. I do wish it were a little bolder and had a fuller nose. It’s a little timid, but when you grab a whiff, it’s quite nice. Final Thoughts: The enjoyment of this beer will really depend on your tongue’s relationship with hops and malt. While the front and middle toy with a malt and citrus sweetness, the strong bitterness lands like an everlasting gobstopper on the finish. It may have difficulty satisfying the fruity or hoppy IPA drinkers it seems to be targeting. I think you really need to appreciate both aspects to enjoy this beer. I can appreciate this for being a bit different, but the sweet malt ends up being crushed by the dry, floral bitter finish, making for a beer at odds with itself. For my money, I think this is an affordable IPA that doesn’t play it safe but ends up providing a confused taste. It’s trying to satisfy the malty and hop head IPA drinkers and end up being a niche beer in that regard. Also, I would note that this beer mellows and becomes far less interesting as it warms, so I would actually start this a little cooler at 50.